Smells like delicious grape soda! Who doesn 't love the smell of grape soda? Can be diluted, but why would you want to? Every Sunny Delight® commercial started off exactly the same: three guys in the back yard and one of them says, “Dude I am sooooo thirsty, what do you got to drink in the fridge?” So excited, they run to the fridge, pull open the door and, “Well, we 've got some soda, some Purple Stuff, and Sunny D®!” Of course they were going to pick Sunny D® in the commercial, but if you came to our house and those were the only choices we had, the only clear choice is that we really shouldn 't be friends. If anyone was like, “What do you got to drink?” and we replied “Well, we 've got some ketchup, some gravy, toxic waste, or Sunny D®,” you 'd say, “Is there any lead in your water, because I hate all four of those.” Personally, we prefer the Purple Stuff. Purple is awesome! Even saying the word “purple” makes you want to smile. When we say “purple,” the first thing that comes to mind is that big grape from the Fruit Of The Loom commercials that was always so damn happy. At Chemical Guys, we like to have fun and be kids. Even though we all watched plenty of commercials as kids, the Sunny D® commercial was one that stuck in our minds! Maybe it 's because we all kind of wondered what if the kids just chugged the purple stuff in the fridge. We love everything about grape drinks and grape sodas, especially that sweet grapey scent. That 's why we developed Purple Stuff Air Freshener & Odor Eliminator. It smells like a delicious grape soda on a warm summer day. When you pop the top on a fresh can and that delicious smell of grape fills the air, all your troubles seem to just melt away. 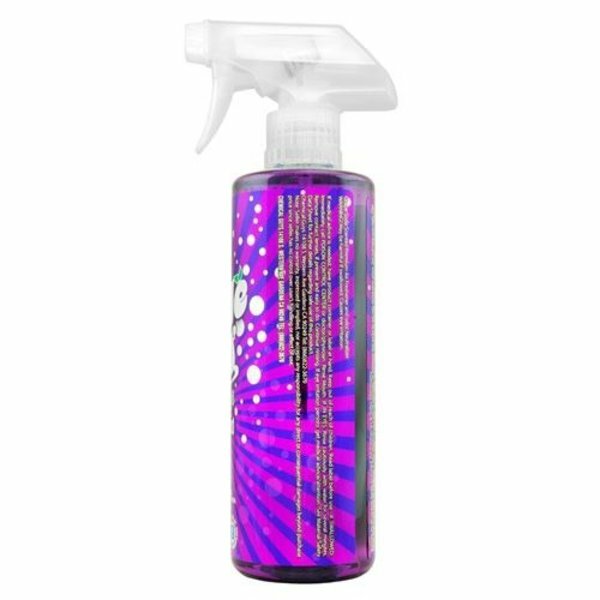 Mist some Purple Stuff Grape Soda Scent to purge foul odors from your car, and relive the innocence and fun times of your youth. 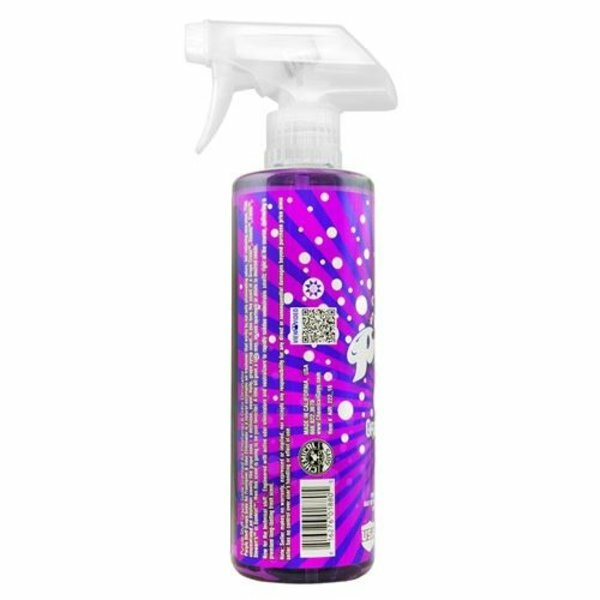 Chemical Guys Purple Stuff Grape Soda Scent brings back the best memories from your childhood. No trip to the hotdog cart on the street or outside the hardware store was complete without cracking open a can of delicious bubble grape drink! We teamed up the chemistry that makes that delicious grape soda scent with natural odor-eliminating enzymes. So even after the refined soda perfumes and stale air smells inside your car dissipate like a distant memory, these odor-eliminating enzymes ensure that any foul smells are purged from the space so that the area smells like… nothing. 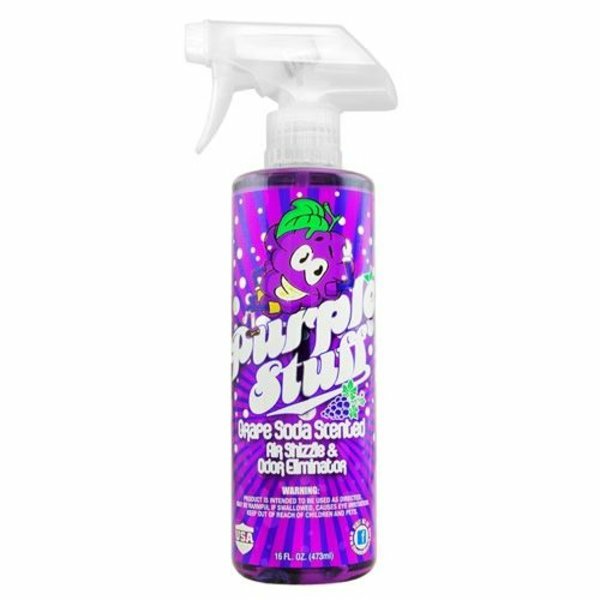 Purple Stuff Premium Air Freshener & Odor Eliminator is a concentrated long lasting premium air freshener with natural enzymatic odor elimination properties to eliminate odor and reduce recurring odor. Use sparingly or dilute accordingly for superior air scents, and long lasting deodorizing ability. The scent bottled within may cause flashbacks to your early childhood where you definitely did have a grape, purple mustache from drinking a grape soda. Pet beds, cars, boats, hotels, restaurants, garages, work areas, hospitals, carpets and upholstery, and anywhere else that needs a fresh crisp scent. The possibilities are endless with Chemical Guys Purple Stuff Grape Soda! 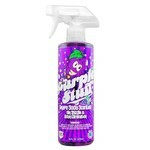 Purple Stuff Premium Grape Soda Scent Air Freshener & Odor Eliminator is available in 4 ounce and 16 ounce sizes. Lightly mist Purple Stuff Grape Soda Scent around carpets, cloth upholstery, and under seats. For AC flushing service: set AC to max cold and recirculate, then mist a few sprays of Purple Stuff Grape Soda Scent underneath the recirculation intake under the dashboard on the passenger side.